SIOUX CITY — Head coach Jake Stevenson made history with the announcement of the 2019 all-Great Plains Athletic Conference teams. 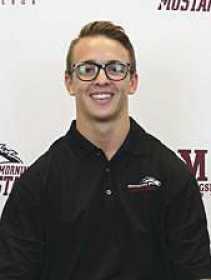 He became the first Morningside College head wrestling coach to be named league Coach of the Year. Stevenson’s award was well deserved as the Mustangs tied Concordia University for the dual title and captured the GPAC/National Association of Intercollegiate Athletics regional tournament championship. The Mustangs put seven individuals on the top two squads. Senior 125-pounder Keegan Hessler (Scottsbluff, Neb. ); senior 197-pounder Caleb Deemer (Palmer, Alaska); and sophomore heavyweight Phil Rasmussen (Luxemburg, Wis.) were selected to the first team. It was Hessler’s third overall and first first team award. The second team accolades included senior 149-pounder Dakota Drenth (Hartley, Iowa); junior 157-pounder Kyle Fowler (Elk Point, S.D. ); senior 174-pounder Nickolas Madsen (Le Mars, Iowa); and junior 184-pounder Jacob Wiley (Sioux City, Iowa). Drenth was honored for the second time in his career. Morningside’s seven selectees were the most in a season since 2014. The Maroon has had at least one wrestler gain recognition on the first or second team every year since 2007.